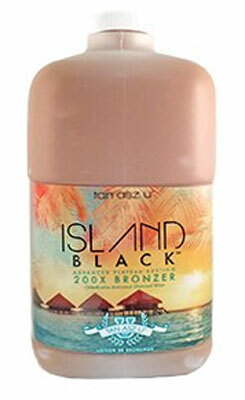 Tan Asz U ISLAND BLACK Plateau Busting 200 X Bronzer - 64.0 oz. Home/Tanning Bed Lotion /Tan Asz U /Tan Asz U ISLAND BLACK Plateau Busting 200 X Bronzer - 64.0 oz. There’s black, and then there’s island black. This worthy-of worship island glow continues to develop beyond your darkest desires, ultimately reaching an unmistakable paradise bronze. No luggage & jet lag-the best part of an island getaway is right here. Save 65% Tan Asz U COCONUT CABANA Tanning Advanced Bronzer - 64.0 oz.